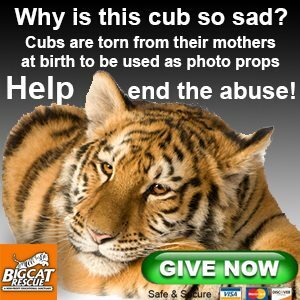 I just finished Zoo College and truly enjoyed learning about the work that is done there at Big Cat Rescue and the steps you take to be sure you and the animals are safe. As well as, the lengths you go to ensure the health of the cats. I can see why they live into their late teens and twenties. I wish I lived in Florida to volunteer for you and the cats. I will be looking at doing a vacation with you guys. Thank you for allowing us to look into the inner workings of the sanctuary through Zoo College, Explore.com, nest cams and go live. I think its awesome.